There is NO freedom of religion when it comes to freedom of place of worship. You can’t decide, suddenly, that you can worship everywhere and anywhere. Your work station at work can’t become a Church for services suddenly. Maybe you’ve discovered a Rastafarian holy site at a Subway station, well too bad, you can’t decide you’ll just now impede everyone else by having prayer sessions. Religious freedom is predicated on the theory of government not interfering with one’s faith, government not having religious quotas for certain jobs or not discriminating unduly against specific faiths. But government can zone an area residential and curtail whether churches, mosques and other places of worship can be constructed there. Under the doctrine of freedom government usually can’t interfere with your right to have religious services in your home. But it can interfere in the ability of students to have prayer before a game or for religious groups to use state property. Property is a major arbiter of one aspect of religious freedom. A church property or mosque property is owned by a group for the use of that group’s religious rituals. Where, in the “religious freedom” debate did it suddenly become up for grabs for any group that wants to use it? An Orthodox Jewish synagogue doesn’t have to allow services from Christian, Muslims and other groups. So how did the Temple Mount become an issue of religious freedom? Why is there a question of “freedom of worship” when the question should be who owns and administers it and for what. 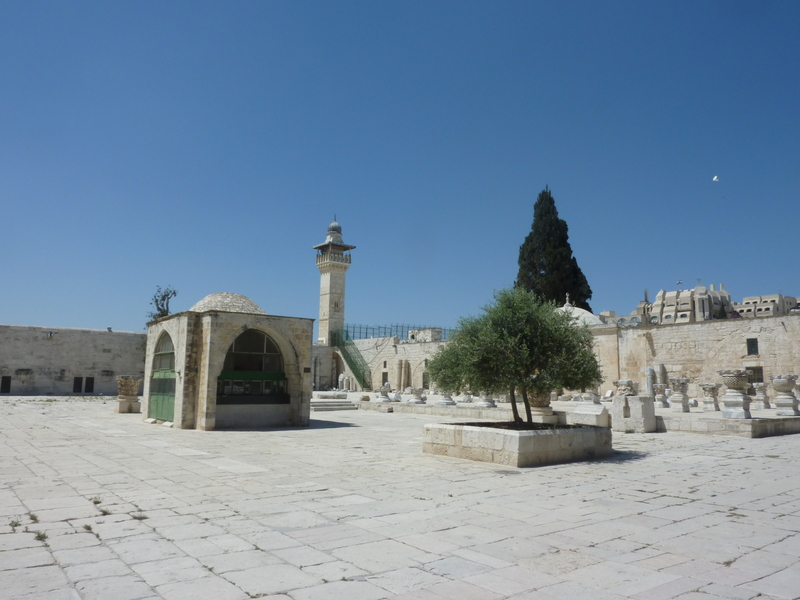 If the Temple Mount is owned by the Islamic Wakf, why is there any debate about access? Why is this an issue of “freedom” and not “ownership”? One doesn’t have the religious “right” under “freedom” to simply pray wherever they want. Now if the question about the Mount has to do with ownership and the theory is that the holy site is a shared religious site with multiple owners, then it still is not an issue of “freedom.” Consider how the “freedom” scam works. Does one suppose that Muslims and Christians are “free” to pray at the Western Wall (Kotel)? No. No one accepts the theory that Muslims, deciding to worship at the site of “Al-Barak” which is said to be located at the Kotel, should have a “right” to worship there. But it’s about “freedom”? No one supposes Protestants have a “right” to conduct religious services in the Holy Sepulchre. Why? Because they have no ownership stake in the Sepulchre and thus have no rights to any part of it. Of course Protestants are allowed, by permission of the other faiths who run the Church, to enter the Sepulchre, but not to conduct services. If the question about the Temple Mount is about ownership, then where does the supposed Jewish ownership interest begin and the Wakf’s end? At the doors of the mosque? Or is that part of the “freedom to worship” aspect also? That is where the lie of the “freedom” campaign becomes clear. Ask, where does the freedom of Muslims to worship begin and end? Oh, is it supposed to be a “shared” site? No one wants to answer that question. Because it is easy to talk about “discrimination” and “freedom” on the Temple Mount. There is no “discrimination” against Jewish worshippers anymore than there is against Muslim worshippers at the Kotel. The Temple Mount is administered by the Wakf whose authority and de facto ownership has been conferred upon it by Israel and, previously, Jordan. As a religious endowment, it manages as a form of religious trust. Because of the tourist aspects of the area, there is an understanding with the Wakf to allow non-Muslims to enter the site, similar to some other religious holy sites in the world that also have a tourist component. What is the nature of religious freedom in a shared site? We know the Europeans went to war over the status of ownership of the Church of the Nativity. These are not simple things relating to “freedom” but rather clear rights that have to be demarcated and spelled out. Holy sites are not simply “shared” and where one worshipers rights end another’s begins. People point out the Wakf is a religious endowment granted authority as a custodian or trust over the area in an agreement with Jordan and Israel. Much of this is semantics. Wakf’s a normal way to put religious property in trust in the Middle East. It isn’t like because it is run by the “Wakf” that makes the Mount different than other types of sites. The fact that Israel wrested control over the Kotel and administers it through its own paradigm doesn’t diminish the Wakf’s authority. The Wakf acts as a type of owner, whether that is at Israel’s pleasure, or it entails only “control” and “administration” is largely irrelevant. The National Park Service in the US administers state land as a park. Fine. It doesn’t own it. But it can also restrict certain activities on it. In a contentious example in the 1990s Muslims “discovered” a holy site near the Church of the Annunciation in Nazareth and demanded rights to build a giant mosque next to the church. This was not a surprise. In many instances mosques and Muslim “rights” to prayer appear next to Churches or holy sites of others, an issue I have written about. The debate over “rights” go hand in hand with power and politics. But the state has to arbitrate these “rights” and there seems no compelling reason to always allow every decision by worshippers to impose their “rights” where they please. Mirabelle at Israellycool has responded to this piece. She writes that “in the US, rules that regulate conduct in public spaces must apply equally to all religions.” This is the crux of the argument, the Temple Mount is not a “public space.” There is no discrimination by the state regulating a public park, or subway station because the Haram al-Sharif isn’t a public area. It is a consecrated Islamic Wakf administered holy site and area and mosque (the site includes numerous elements). This is the confusion that creates the “religious liberty” issue. Is this just an issue of “interpretation,” such that Jews who advocate prayer there “dispute” with Muslims over whether this is a public space? No. Because it has not been and was not treated as a form of state property. The dispute might be on whether Israel should declare it a public space and administer it as state property or a tourist attraction (like Turkey does the Hagia Sophia). But, if Israel does that, it is primarily a change in property status, which then brings up issues of religious freedom relating to that new status. But since that is not the status and it is not a public space, then it is not an issue of religious freedom. Mirabelle raises this issue of Christians visiting the Kotel (“Seth’s claim that Muslims and Christians are not permitted to pray at the Kotel, I will respond simply by providing an example of a prominent Christian praying at the Kotel.”). But no one honestly suggests organized Christian prayer groups, with crosses and singing and a pastor leading a prayer would be acceptable at the Kotel. Muslims and Christians are permitted to pray at the Kotel to the degree that the Jewish and state-sanctioned managers of the Kotel permit them to pray there. By custom, for instance, they wear a head-covering or women cover their shoulders. This example of restrictions of prayer is perfectly made in looking at issues like Women of the Wall, who have long been banned from certain types of prayer at the site. The very fact that Jews are forbidden from praying in certain ways at the Kotel, should illustrate my point quite well, namely that “religious freedom” is not the real issue here. Administering the rules of a holy site by an authority tasked with managing it and/or with rights of ownership to it, is the issue. No one has “rights” and “freedoms” to do whatever they want at the Kotel. ← Does accepting ‘white privilege’ reinforce privilege? 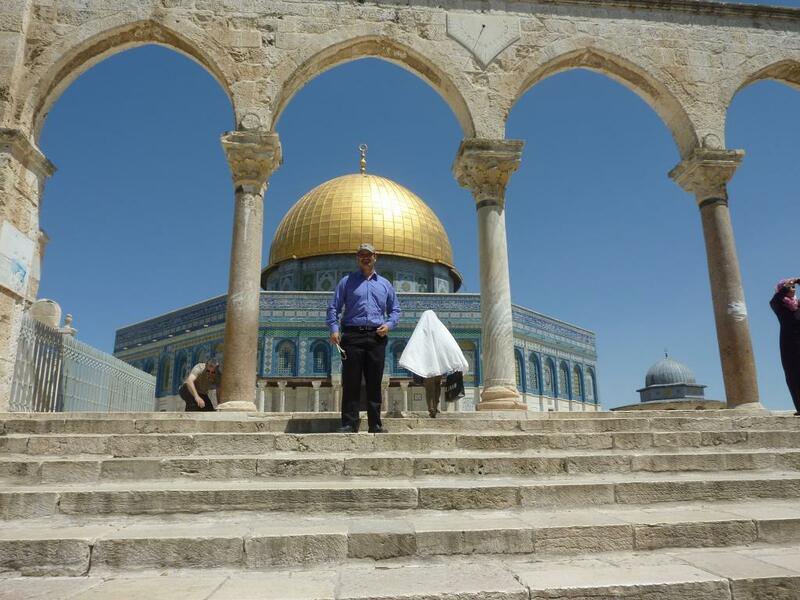 So does the Waqf own the Temple Mount or not? Can it declare all of the Mount to be a mosque and block access to anyone? How does a Jew saying a prayer there limit the freedom of Muslims to pray in the numerous mosques at the site? As far as I understand, the Waqf administers the area since the Muslim conquest in the 12th century. That in itself is not granting it “ownership” of the site. And the site is not “suddenly” holy to Jews, it has been so for millenia. Whether it is appropriate for Jews to pray there is an internal disucssion in Judaism, to be resolved internally. 800 years is a long time to administer something, and on behalf of whom? But let’s say your view is correct and the state is the ultimate owner. So again, it goes back to ownership. If you believe the state of Israel is the owner, then the state has to decide which group to allow to administer it. The state has abdicated that authority, like previous governments to the Wakf, and in so doing, like at the Kotel, allowed for certain parameters of prayer. Either way the state always has the right to step in and assert its control and take the place. But the issue always boils down to that issue, of ownership, control and administration. It is not an issue of “freedom.” People are not free to pray wherever they want. Even at the Kotel. 800 years is a long time indeed, and the administration began with a conquest. The length of time is rather irrelevant here, it says nothing about the ownership. I haven’t stated my opinion on the ownership, but was referring to the fact that the State of Israel has declared itself owner. People are not free to pray everywhere, indeed. We can debate whether that is just, but that is a more academic discussion. On the ground though, it seems reasonable to recognize the thousands of years of Jewish heritage on the Temple Mount, and to allow Jews that wish so to worship on the compound. They are not asking to pray inside the mosques, there is plenty of space there for everyone to coexist. If Muslims would accept that they are not the sole ruler of the area who can do there as they please, with complete disregard of the Jewish (and Christian) tradition and heritage, it wouldn’t be an issue. I agree completely with your analysis, Seth–translating all disputes into conflicts of “rights” is a peculiarly American approach, and moreover a generally unproductive one, since it makes compromise more difficult. Who, after all, wants to give up their “rights”, and how can we demand that someone be deprived of them? But toss out all the rhetoric about rights and discrimination, and a political question remains: while increasing numbers of Israeli Jews appear to want the government to exercise greater control over the site, either for religious reasons or as an assertion of sovereignty (or both), the Wakf and its domestic and foreign allies perennially work towards undermining that sovereignty. Should the Israeli government care? (One way or another, domestic politics may force it to.) And if so, how should it manage the conflict? Is the “status quo” (which is in fact constantly shifting slightly in various directions) sustainable? If not, can a more stable one be established? How would you answer these questions?